What The Heart and The Eyes Want | THE GOOD . . . THE BAD . . . AND ME. The reason I always heard is I’m not yet married because I’m choosy and have high standards in men — that I’m too stuck on a certain ‘type’ that I cannot settle for anything less. It does sound shallow and vain if that’s the real reason. But, I have to put my foot down and say a very simple reason: I like being single. In fact, I make being single an art form (heh!). Being single is a choice I made; I wasn’t forced into it. If I want to have a relationship right this minute, I can. But what kind of relationship would that be? Yes, I admit. I have a type. Who doesn’t? If any random guy will do, it will be a miserable end to years of getting smarter in having another man in my life; someone who is not only physically attractive to me, but who’s going to be a great companion in growing old — an equal that balances out my faults and weaknesses. Having a ‘type’ is as normal as preferring a certain fabric of underwear other than cotton. I may find someone attractive, but the doesn’t mean that the girl sitting next to me while I people-watch does too. With the basic instinct to mate and propagate the species, will one seriously hook up with someone that doesn’t fit the ‘type‘? Of course not! 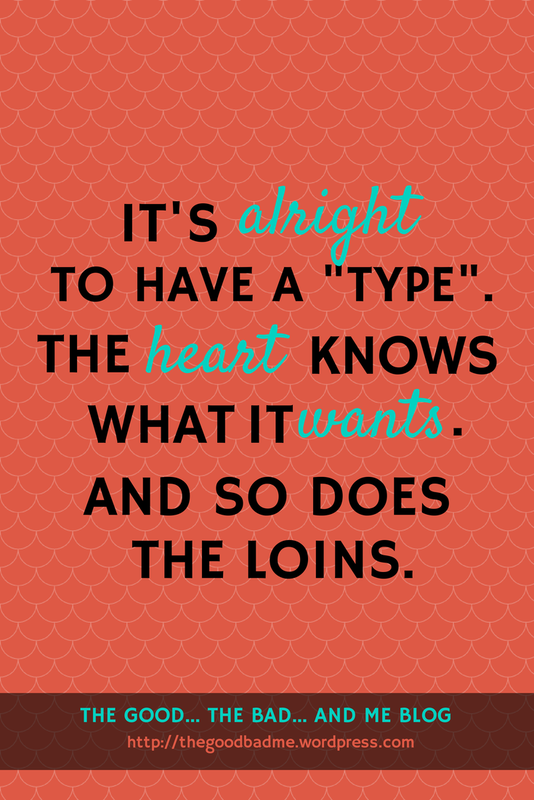 The heart might be important in starting and keeping a relationship, but so does the loins. We need emotional attraction… and physical attraction. A balance of both is a great thing to keep a relationship going — I’d be a hypocrite if I single out the emotional bit. Going back to the choosy part . . . The set of standards that they all accuse me of having too high is not actually that unreachable. It’s what most women look for in a potential mate. But when you reach your thirties, it’s a different thing. What seems to be normal standards for a twenty-year-old is over-the-top when you’re a thirty-something when it’s just the same: We want partners who will love us unconditionally, has a highly-functioning brain, someone who treats us as equals, emotionally supportive and has the means to establish a family. See? Those are common things one looks for in a potential mate, right? I don’t think the others see it that way. Well … boo-hoo! I live make my own choices in life and that includes who to end up with and when. If only I can hypnotize or spread out a subliminal message to anyone who wanted to bash my chosen singlehood and give me snarky looks like I have a forked tail hidden under my sweat shorts . . .